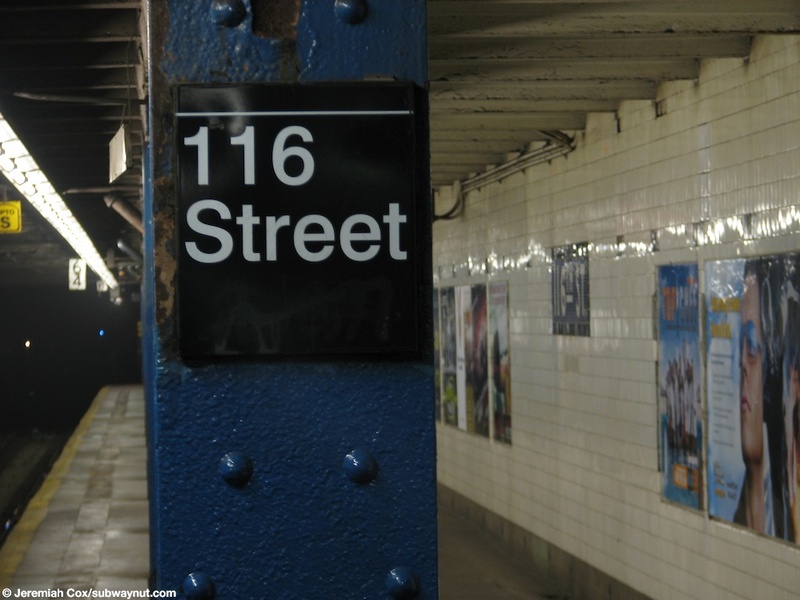 116th Street is a simple IND local stop. 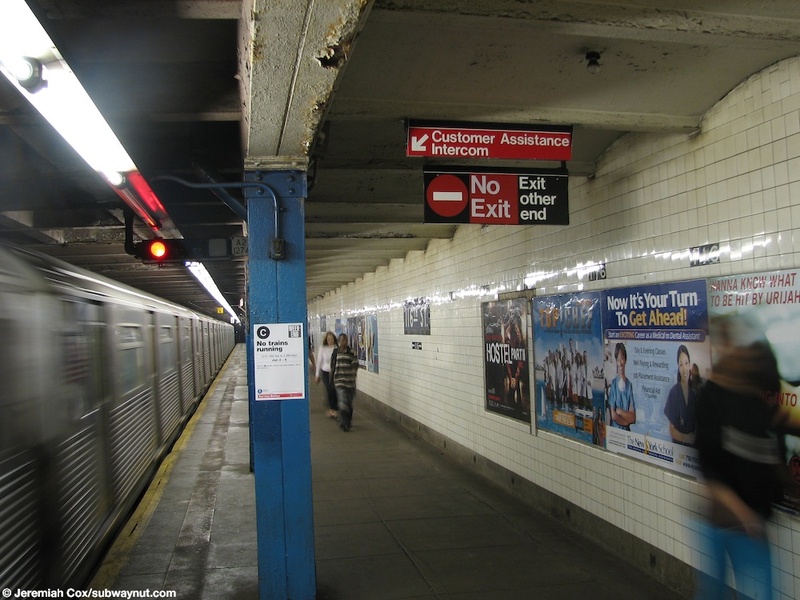 There are two side platforms on the four-track Central Park West line. 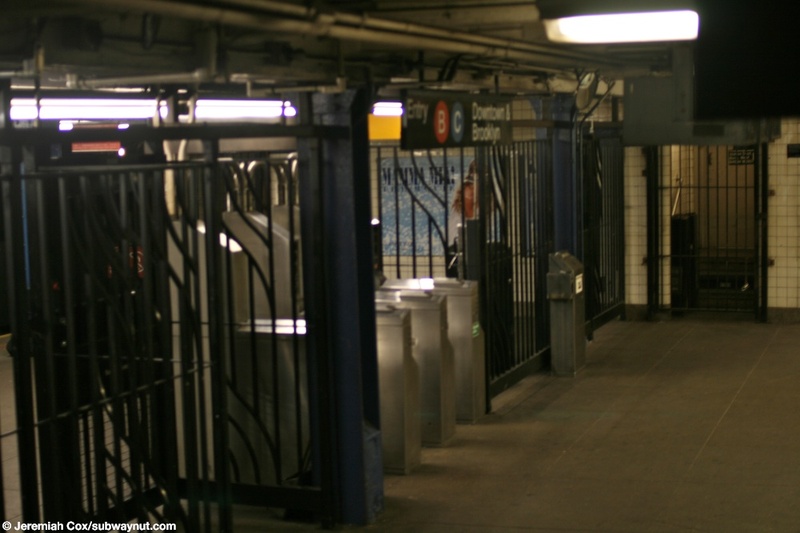 Each platform has one exit at its southern end with staffed token booths on either platform and each has two exits to the street. 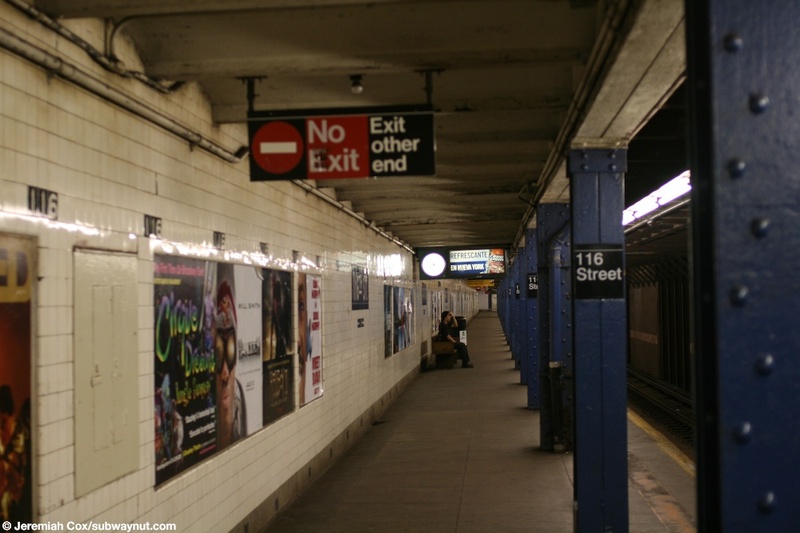 There is evidence of another exit at the northern end of the station (probably to 118 Street) but all signage in the tiling saying where it went to has been covered up. There are some tiles though that were definitely applied at a different time because they stand out from the name tablet underneath them. 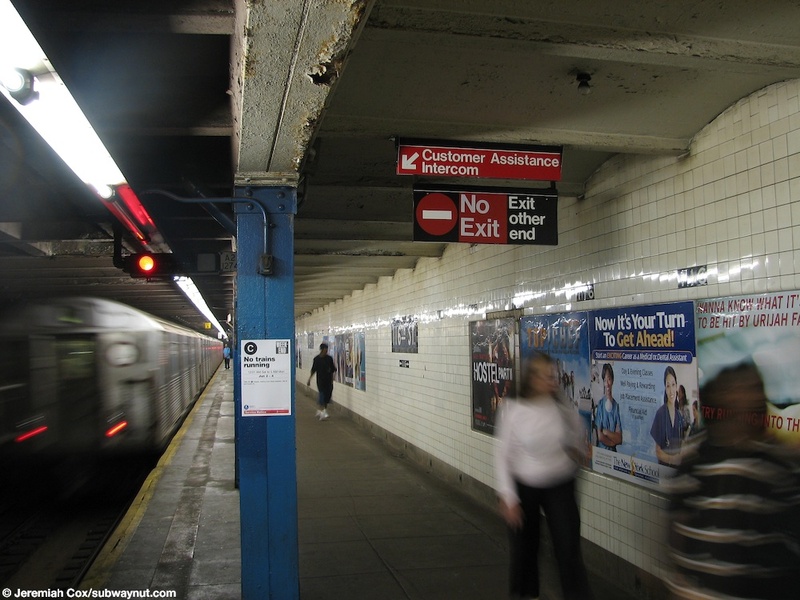 There are staffed exits with token booths on either platform and each has two exits to the street. There is no free crossover or under. 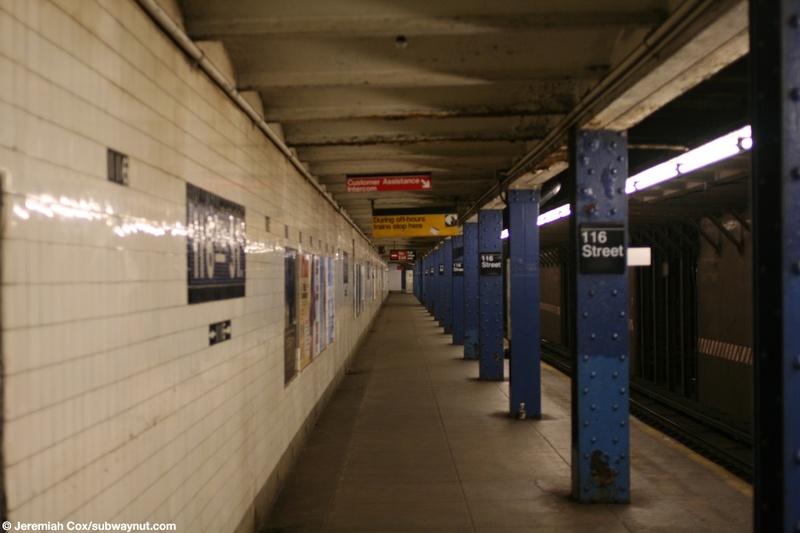 The station has columns painted blue and blue name tablets and like all the Central Park West (81st Street's renovation was so large that it has trim but not in what would have been the original IND format) local stations has no trim just 116 tiling towards the top of the side platform's walls. (116b1) Looking down the uptown platform at 116th Street a R38 C train has closed it's doors and is ready to leave the station. 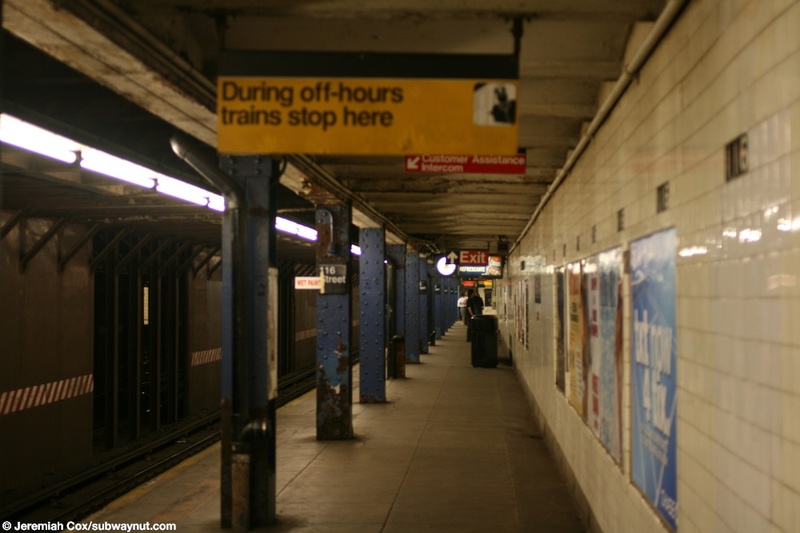 1 June, 2007 (116b2) A uptown R38 C train has begun to leave 116th Street. 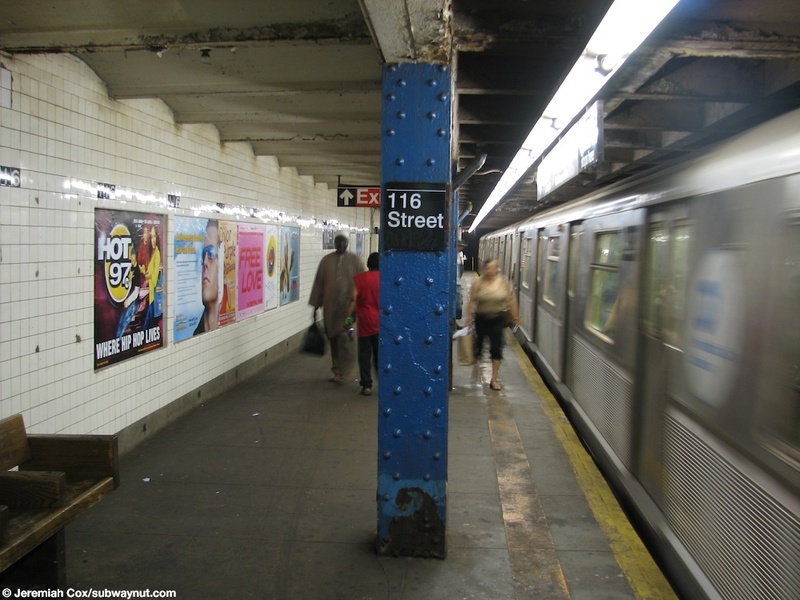 1 June, 2007 (116b3) A uptown R38 C train has left 116th Street as passengers still walk towards the exit at the very southern end of the platform. 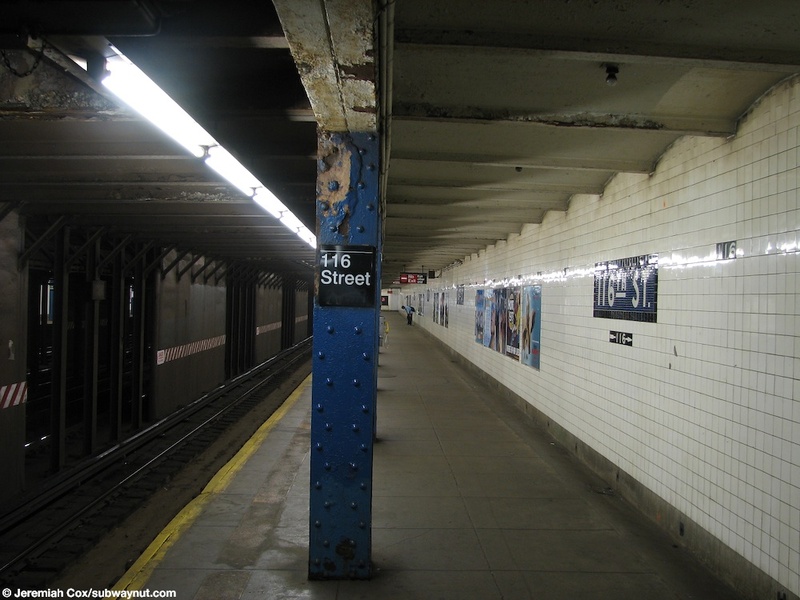 1 June, 2007 (116b4) Looking towards the northern end of the platform at 116 Street, where there used to be a second exit. 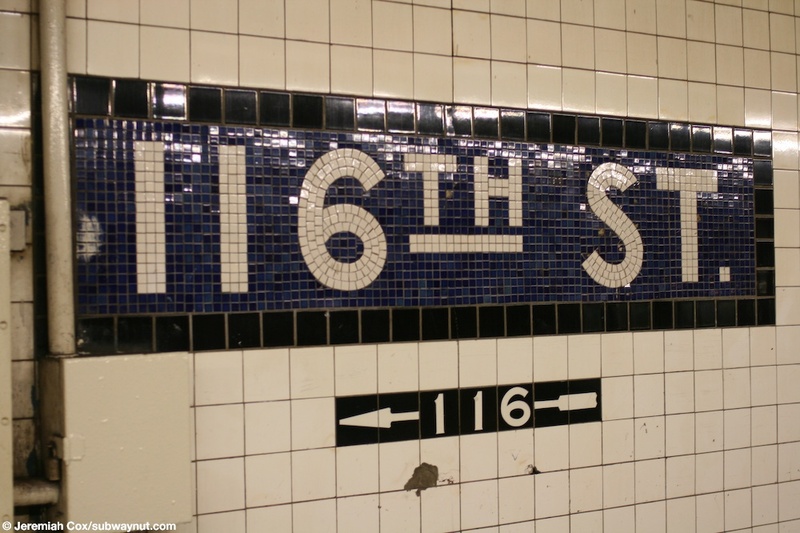 (116b5) A close up of a 116 Street column sign. 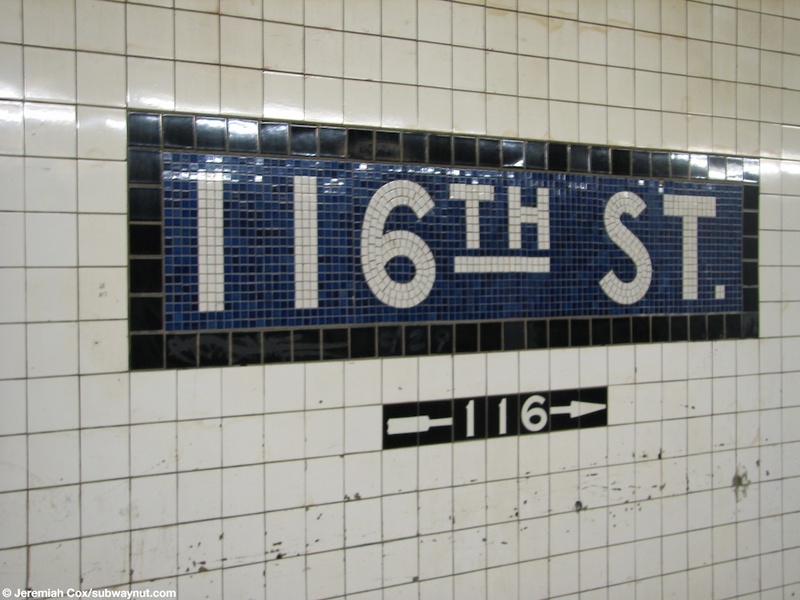 1 June, 2007 (116b6) A name tablet at 116 Street, with the text for the only exit at 116 underneath it. 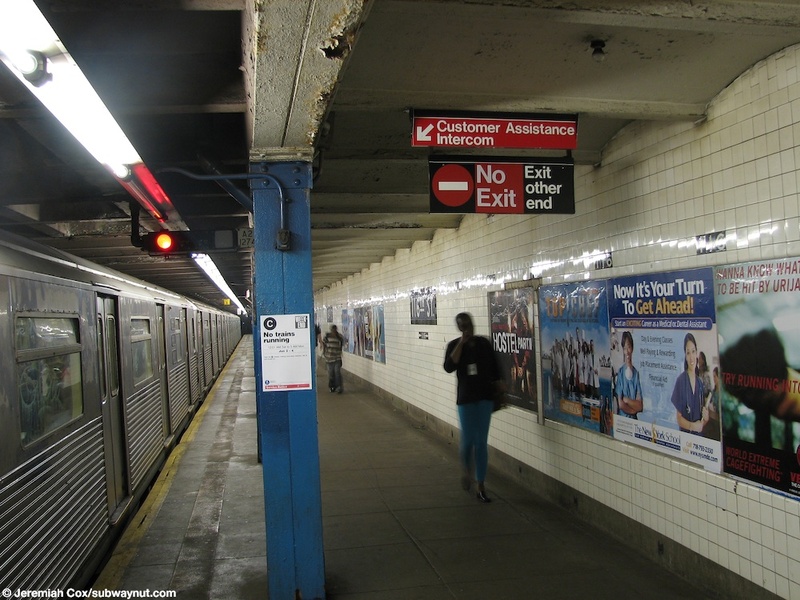 1 June, 2007 (116b7) Another view down the platform at 116 Street with a R40S B train entering the station. 1 June, 2007 (116b8) An entrance to 116 Street. 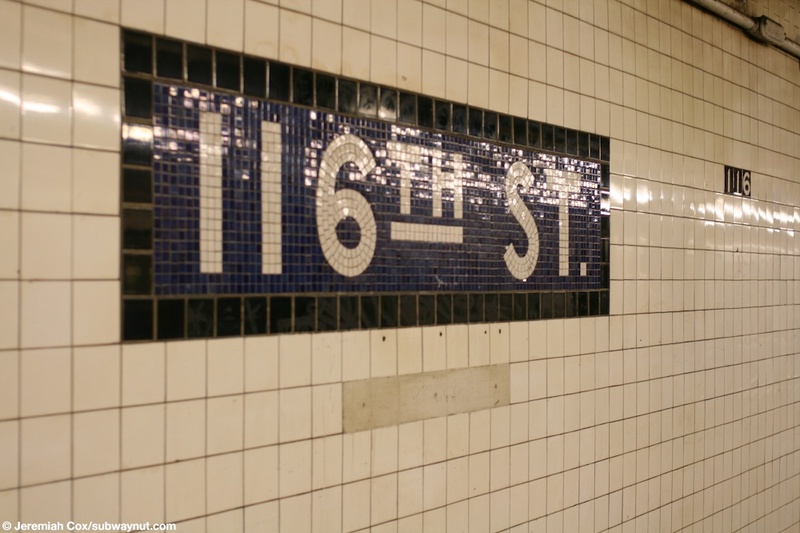 The NW corner entrance to downtown trains at 116 Street and Frederick Douglas Blvd. 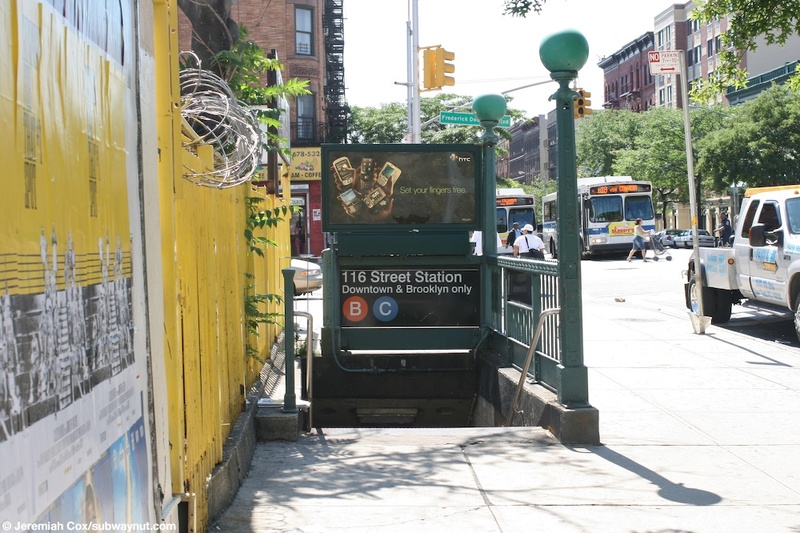 (116b9) The four turnstiles for trains to Downtown & Brooklyn at 116 Street. 26 June, 2008 (116b10) A different name tablet at 116th Street with the arrow for the exit at 116 underneath it. 26 June, 2008 (116b11) Looking down towards the northern end of the downtown platform at 116 Street. 26 June, 2008 (116b12) A passenger enters the system at 116 Street for a B or C train to Downtown & Brooklyn. 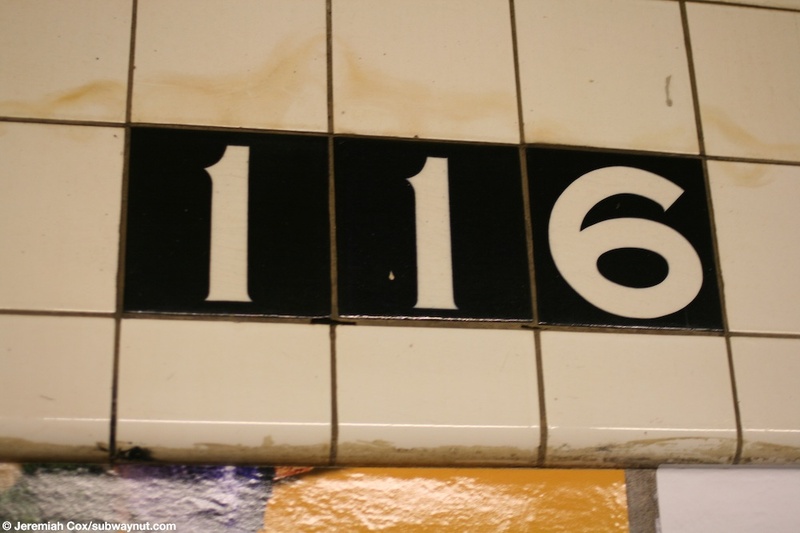 (116b13) A close up of the 116 tiling just above the advertising panels. This station has no trim of any sort on top of this numbering. It's just white tile. 26 June, 2008 (116b14) Looking down the downtown platform at 116 Street. 26 June, 2008 (116b15) Looking down the downtown platform at 116 Street towards the stations only exit. 26 June, 2008 (116b16) Another name tablet at 116 Street. Tiling that used to point towards the stations other exit that is now closed is evident in the tiling that has been painted over underneath the tablet.